So while the rain poured down, the girlies and I sat down at the big wooden table in the living room and painted ourselves a summer's full of rainbows. Last night, I even dreamed about rainbows, we painted so many rainbows. I cut one huuuuuge piece of Strathmore watercolor paper into 14 4"x5" postcards, although I don't think we'll actually end up having to mail any invitations this year. Still, postcard size is a good size for an invitation. 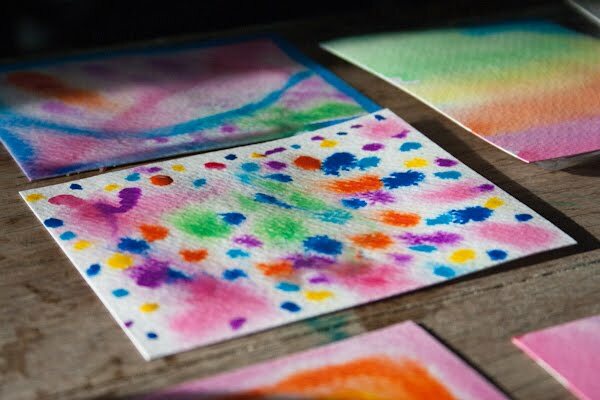 Wet-on-wet watercolor is just a different way to watercolor, and I don't even necessarily think that the results are that better--just a little different. 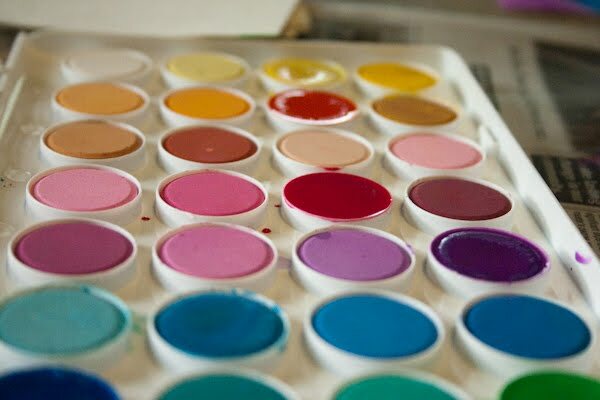 With wet-on-wet watercolor, the watercolor paper is also wet, and so the paint spreads more, and saturates the paper more easily, and you get that spread, saturated look that always screams "Waldorf!" 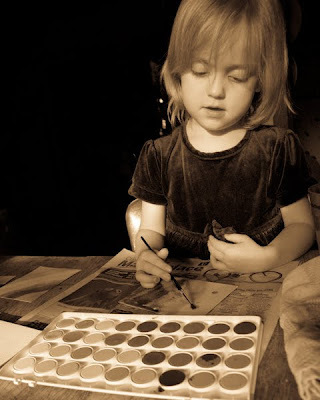 to me--wet-on-wet watercolor is one of the trademarks of Steiner education. 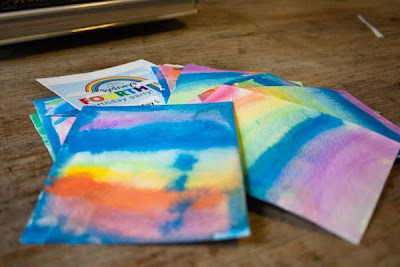 If you're doing this with larger pieces of watercolor paper, you'll likely need a tub, or the sink, to soak the paper in, and I can't even imagine that you'd want to do this at all with the largest pieces of paper--unless you got several people to crouch around the same piece of paper and all paint at once, a really large piece of paper would dry out before you were done with it. You can also see why you need professional artist's paper for this. It takes a nice paper to still be usable after you drown it. 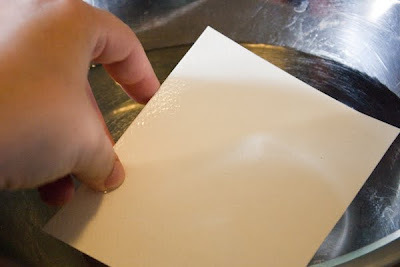 After the paper is totally saturated, lift it out of the water and, depending on how big the piece is, either just shake the excess water off, like I did with these postcards, or blot the excess water off with a clean towel. The paper will still be wet, of course, but you don't want big drops of water on the surface, because that will dilute the paint. A rainbow invitation to a rainbow party. I can't wait for you to see the ridiculous dress that I'm sewing for Sydney to wear. so awesome! i can't wait to see the dress too! and, i want cosmo to try the wet on wet water color. i think he will like it. We love water colors. Salt is fun, too. Wet on wet watercolor does make it easy for the kiddo to have a satisfying experience--stops that whole too-dry brush scraping across the paper thing that always gives me the heebie-jeebies. Ooh, yeah, salt! And crayons, too!